After wondering around Columbia for hours at 100F (=38°C), it was time to hit the road again and cool off in the High Sierra. Donnell Vista Point, 15 miles east of Strawberry on Highway 108, is good place to stop for a bathroom break and stretch your legs. A short walk among beautiful, smooth granite boulders and gnarled pines and cedars takes you from the parking lot to the vista point with its sweeping views of the Donnell Reservoir and the Middle Fork Stanislaus River Canyon. This day the Stanislaus River was sending its roaring brown waters into the reservoir, which was not yet at capacity. The first of many more roaring rivers to see along this trip. View across the Stanislaus River Canyon -- Spot light is on! Continuing on Sonora Pass Highway (Hwy 108) up to Sonora Pass. The road was free of snow, the drive was scenic as always, just a minor issue with road flooding in the Kennedy Meadows area, as all the contributory creeks to the Stanislaus River were just gushing down the mountains, and one creek had chosen the shortest way - across Hwy 108. Sonora Pass was open, but the snow banks along the road were still massive, and there was plenty of snow all around. After baking at 100F in Columbia, 55F (=13°C) at Sonora Pass (9,624 ft = 2933m) was refreshingly cold. Heading down the east side of Sonora Pass towards Hwy 395 and Bridgeport, CA there were waterfalls, creeks that had turned into roaring rivers, and meadows which had turned into lakes just about everywhere. The flooded meadows outside of Bridgeport made for lovely reflection shots though. And strolling through the small town of Bridgeport, you might discover some interesting old / older things - from the historic Court House, in continuous use since 1880, to the similar vintage Bodie Hotel ("only for the lover of quirky places"). Just keep your eyes open. After a quiet night in the historic Bridgeport Inn and some more pictures of the flooded meadows, it was time for a quick exploration of Virginia Lake. 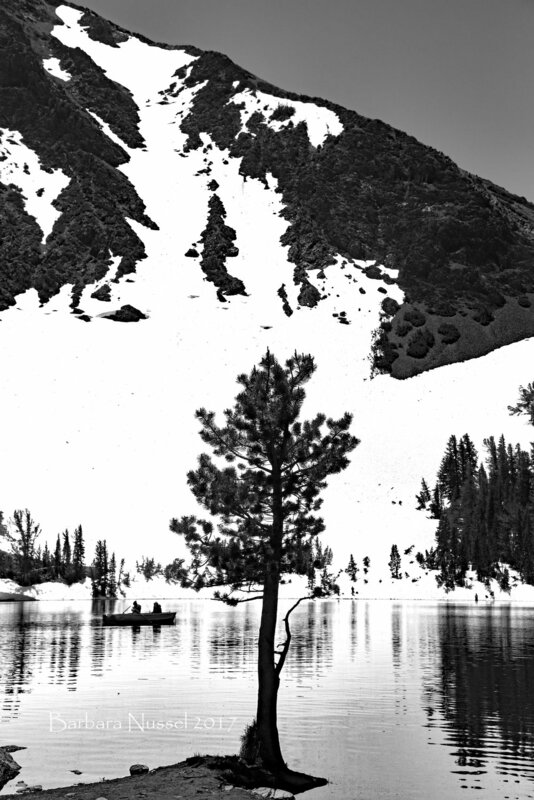 Virginia Lakes is located a few miles off U.S. Highway 395 at Conway Summit, roughly halfway between Bridgeport to the north and Lee Vining to the south. The Virginia Lakes Resort was just coming back to life. The parking lot was still walled in by massive snow banks, but anglers were anxious to start the fishing season, even if it meant crossing snowfields or standing on snow banks. Virginia Creek was roaring - both into and out of Virginia Lake. 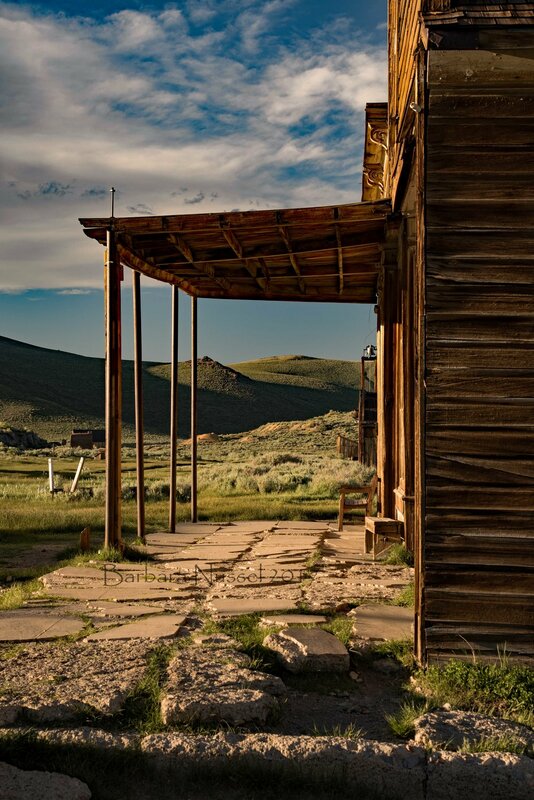 Soon it was time to get ready for one of the highlights of this road trip – an after-hours photo shoot at the ghost town of Bodie. Bodie State Historic Park closes to the public at 6 pm, and after-hour access is only possible when the Bodie Foundation has special events, or if you have managed to obtain a special permit. I have found it most convenient to just sign up for one of Jeff Sullivan Photography’s workshop, in order to have after-hour’s access in a small group setting. 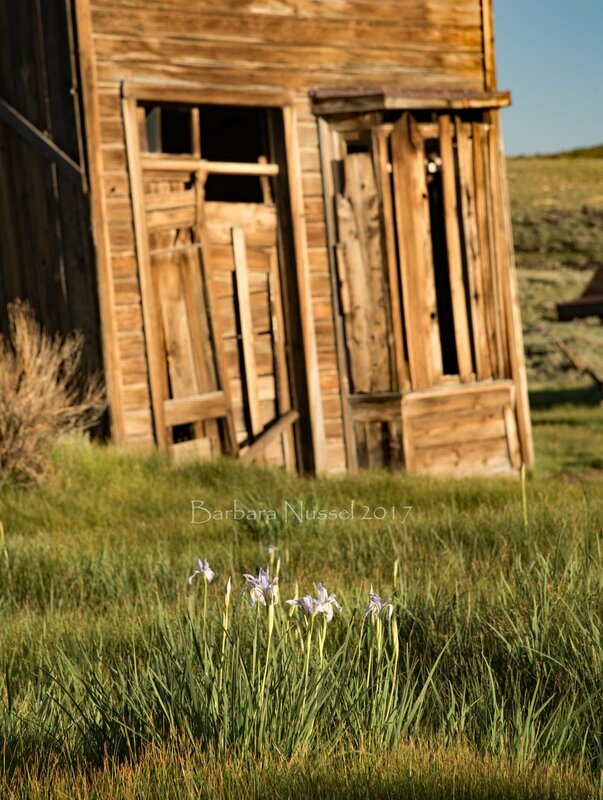 Golden hour at Bodie, with the wild irises in bloom made for some nice photo opportunities. With clear skies, no light pollution, and many interesting foreground subjects for your composition, Bodie is also a wonderful place for nighttime Milky Way photography. Doing nighttime photography at Bodie you have to be prepared with warm clothes, even in the summer time. With Bodie being at an elevation of 8,379 ft (2554 m), it can get pretty cold at nighttime. I learnt this lesson the hard way during a night photography workshop in July of 2016. Excited, but cold and tired after your nighttime photo shoot, the closest place to stay and eat when visiting Bodie, is at the historic Virginia Creek Settlement. They have motel rooms, cabins, and if you’re looking for a real Wild West adventure, you can book one of their two Covered Wagons for accommodation. To see more pictures of this road trip, please follow me on Facebook. Curious about the continuation of this road trip? Stay tuned for Part III , it will come up soon!